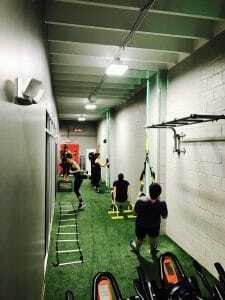 The Training Station Gym practices the oldest form of circuit training. We bring together a group of individuals to exercise together although each does completely different exercises. We call it Athletic Circuit Training. We set up a circuit with stations for kettlebells, barbells, dumbbells, the TRX, tubes, a battle rope, a plyo box, the Air Assault bike, a sled, and medicine balls. One person is assigned to each station. When the instructor gives the command to start, each person does the number of repetitions that they can handle in 30 seconds. They all rest for 15 seconds and during that time each of them moves clockwise to the next station—as if they’re gradually moving around a track. Then the pattern repeats itself until each person returns to his first station. incorporate just about any exercise. Athletic Circuit Training isn’t for everybody. The biggest disadvantage is that some of the exercises are contraindicated for some individuals. People with bad lower backs probably shouldn’t do high-intensity jumping exercises. Exercisers with very unstable shoulder joints probably shouldn’t do snatches. The other disadvantage is that circuit training cannot give individual rest periods. The group exercises at the same time and takes rest at the same time. The only sure way around those disadvantages is to do a circuit alone. An individual can select the exercises that she can actually do. And the rest between exercises and laps can be fine-tuned to help her bring about specific results. If maximum strength is the desired end, for example, then she will take rest between exercises and sets. If cardiorespiratory fitness is the objective, she may decide not to rest between exercises and laps. I usually see individuals doing circuit training. It’s an outstanding way to burn calories on an endless combination of exercise series. But I’ll always be partial to circuit training in groups. It’s what the method was invented to do. It’s where the method’s brilliance is most apparent.